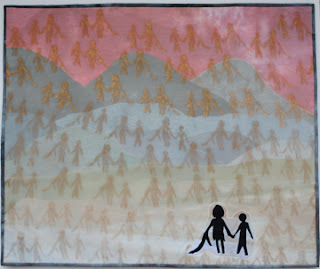 With so many in Colorado losing their homes to raging fires, it is almost eerie that the special exhibit No Place to Call Home opened yesterday in Loveland, CO. Little did we, the artists, know when we all agreed last winter to reassemble our art quilts that our exhibit's theme would be so timely. I am touched and honored that my quilt, Homeless, is once again on view. Homeless was one of my first art quilts to be publicly shown. It was the ability to use my art to make a statement about a horrific world condition that attracted me to enter the original SAQA show. No Place to Call Home toured for a year with the Mancuso quilt shows. The current exhibit in the Foote Gallery of the Loveland Museum runs until September 16. There are 15 quilts in the exhibit. Jeannie Lancaster has written a wonderful review for the Loveland Reporter Herald. Congratulations on the new exhibit, Judy. And yes, a stunning/challenging/timely opportunity to bring this issue to people's attention once again.